Watch our video to learn how airflow tiles can be used to improve efficiencies in a raised floor data center. Chamfer 56% open area airflow panels are designed to provide maximum airflow distribution that fits into any new or existing raised floor system. What Sets Our Airflow Panels Apart? All chamfer panels include our patented stratification fin – one of the hallmarks of Triad panels. This fin allows you to direct the flow of air where you need it, eliminating hotspots and areas with poor air circulation. The fin also provides increased upper server cooling, dropping server temperatures 5 to 15 degrees while lowering energy consumption in a matter of minutes. Triad panels also include patented integrated handles. You can put away that old screwdriver or suction cup lifter you used to pop floor panels. Our integrated handles make lifting and moving panels fast, safe, and easy. Chamfer panels are available in imperial and metric sizes to fit your floor, and a variety of load limits – our only panel rated up to 5,000 pounds – to suit the needs of your facility. 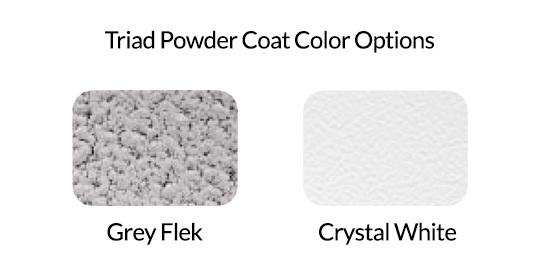 All panels are made in the USA and include a Grey Flek or Crystal White powder coat finish. Triad chamfer and slotted panels are very similar in fit, form and functionality. The grate pattern is the biggest differentiator between the two. Choose the style that best suits your facility.